The trend of employees bringing their own technology to work will grow exponentially next year – whether businesses actively manage it or not, according to an IT analyst firm. Two-thirds of businesses already are seen some form of the bring your own device (BYOD) phenomenon in their office, but just one in four have actively created a policy that allows for consumer devices to be used in the workplace. That’s the findings of an Info-Tech Indaba survey sponsored by Telus Corp. This could cause problems, the London, Ont.-based analysts warn, raising security issues and complicating IT environments with multiple devices and operating systems. For 2013, the most popular technology for BYOD efforts is smartphones with 72 per cent of firms expressing at least some interest, according to Info-Tech. The next most popular is tablets with 64 per cent of businesses expressing interest, and then laptops with 59 per cent showing interest. 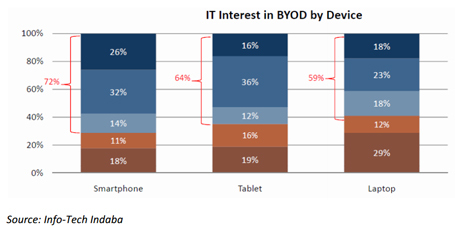 Smartphones are the most popular tech choice for BYOD. It’ll be better for those businesses to take action now and implement a formal policy now, or it could end up costing more money down the line. Businesses surveyed that already have a BYOD strategy on average had lower telecom expenses, were more likely to deploy mobile apps within 24 hours, and were more likely to have no issues passing compliance checks when compared to firms with no formal policy. More survey data and analysis is available in a white paper from Telus and Info-Tech.